The Union barely had time to celebrate Confederate Gen. Robert E. Lee’s surrender at Appomattox Courthouse on April 9, 1865, before the nation was horrified by the assassination of its Commander-in-Chief, President Abraham Lincoln, at Ford’s Theater in Washington, D.C., on April 14 – a mere five days later. One of Pekin’s pioneers was in Washington, D.C., during those days of sorrow: Seth Kinman, who formerly operated a hotel in downtown Pekin, claimed to have been an eye-witness of the president’s assassination, and contemporary newspaper accounts say Kinman took part in Lincoln’s funeral cortege. As a result of his assassination, Lincoln came to be revered as a martyr for the cause of preserving the Union and for the abolitionist cause. The people of Illinois in particular have held his memory in the highest esteem ever since. It is in the state capital, Springfield, where he is entombed, and in towns and cities throughout the state Illinoisans are still proud to point to buildings and locations where Lincoln once lived, worked, or stayed. This is especially true of communities in central Illinois. The Lilly Inn was, of course, far from the only site in our area with ties to Lincoln. For example, his work as a lawyer sometimes brought to him Mason County, where he is known to have stayed in the home of his friend Samuel C. Conwell on Washington Street in Havana. Conwell’s home, which he built in the early 1850s, is still standing. 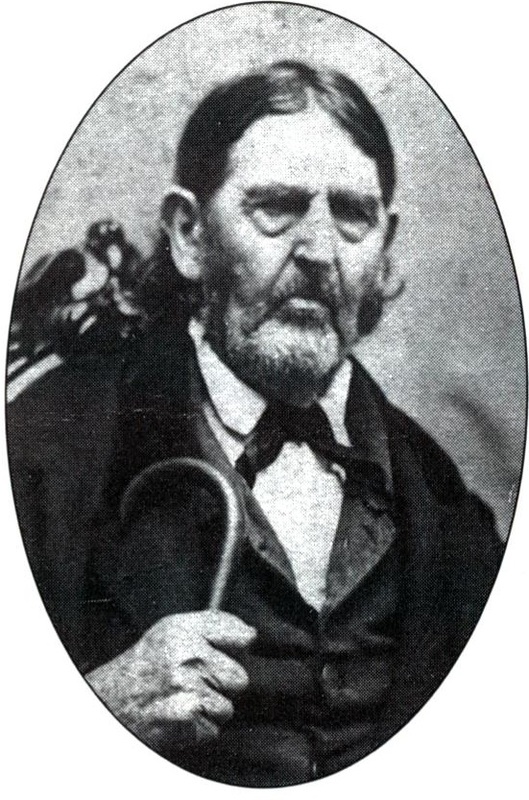 Lincoln’s work brought him to Tazewell County two or three times a year, and he represented clients at the county’s courthouses in Tremont and Pekin. 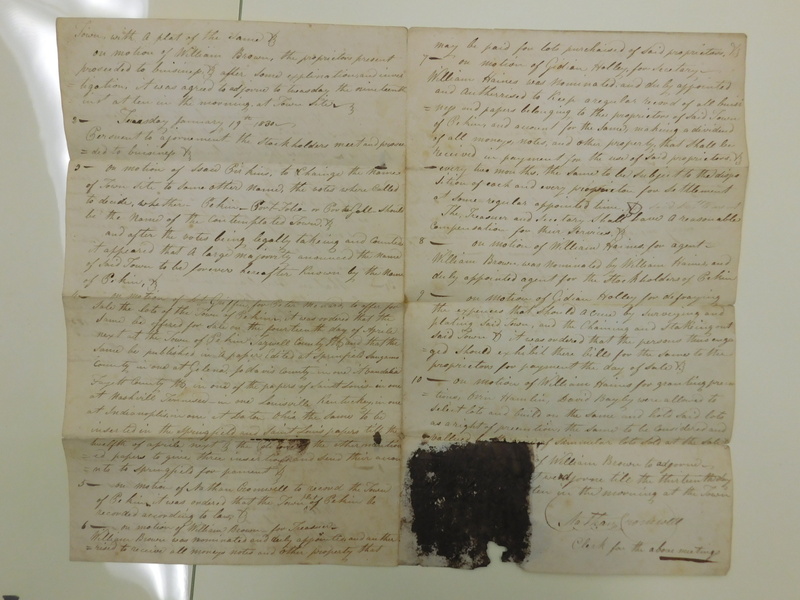 Naturally this work produced numerous Tazewell County legal documents bearing Lincoln’s signature or handwriting or name, and most of these precious mementos of Lincoln’s life, while remaining the possession of Tazewell County, are now in the keeping of the state of Illinois in Springfield. 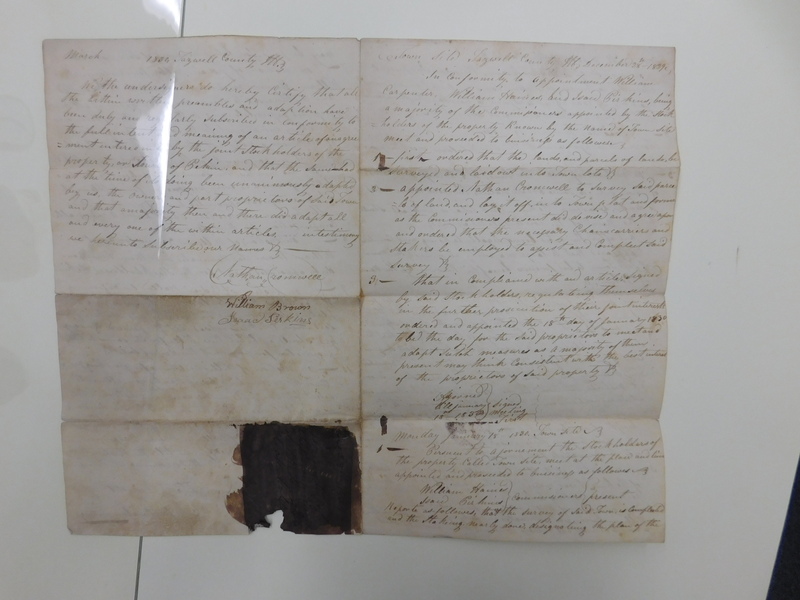 One of Lincoln’s more important cases was Bailey vs. Cromwell (1841), in which Lincoln appealed to the Illinois Supreme Court in Springfield and won the freedom of Nance Legins-Costley (“Black Nance”) of Pekin, a slave of Pekin pioneer co-founder Nathan Cromwell. Lincoln successfully argued that Costley and her children had to be recognized as free under Illinois law since there was no legal documentation establishing that they had ever been the property of the principals involved in the case, or that Costley had ever agreed to a temporary contract of indentured servitude. This 2008 Pekin Daily Times informational graphic chart describes 22 sites in Pekin that have direct or indirect links to President Abraham Lincoln. The list was researched and compiled by Dale Kuntz. 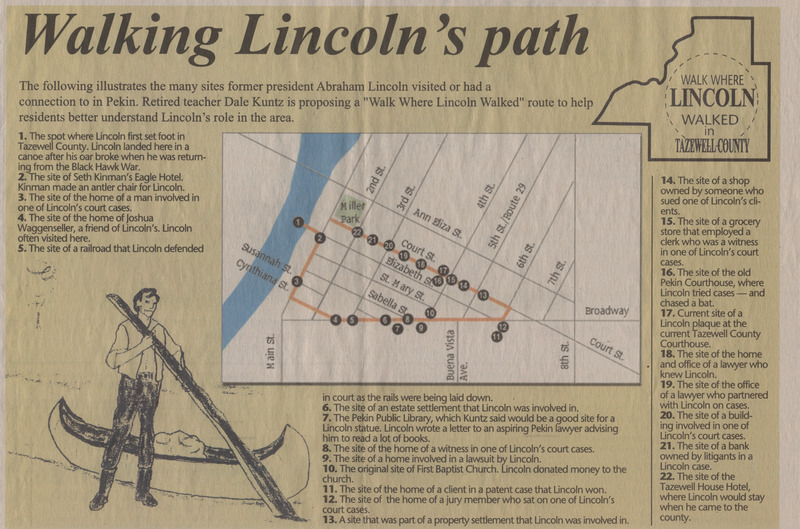 In 2008, retired teacher Dale Kuntz of Pekin, who served on the Tazewell County Abraham Lincoln Bicentennial Commission preparing for the 200th anniversary of Lincoln’s birth in 1809, proposed that the city of Pekin create a historical “Lincoln Walk” in downtown Pekin to help visitors and residents learn more about Lincoln’s ties to the city. 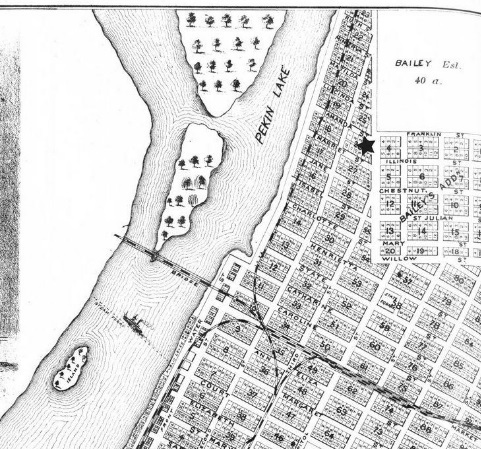 Kuntz’s historical research had identified 22 sites along the proposed route that can be shown to have direct and indirect Lincoln connections, starting at the bank of the Illinois River where Lincoln had landed in 1832 when his oar broke while he returned from the Black Hawk War, then heading along Front Street south to Cynthiana, then east to Broadway, out to Sixth Street, then back west along Court Street to end at Gene Miller Park, the former site of the Tazewell House hotel. 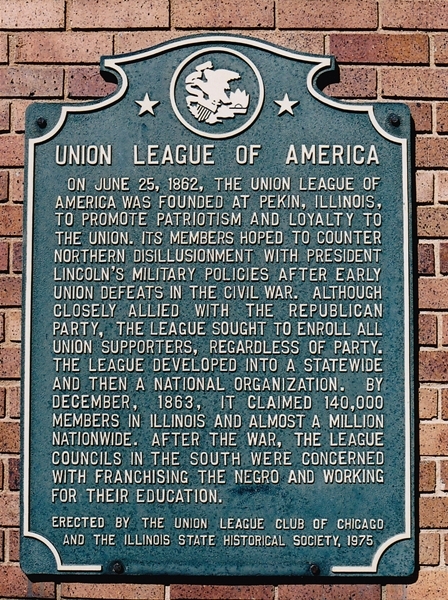 This is a slightly revised version of one of our “From the Local History Room” columns that first appeared in May 2015 before the launch of this weblog, republished here as a part of our Illinois Bicentennial Series on early Illinois history. 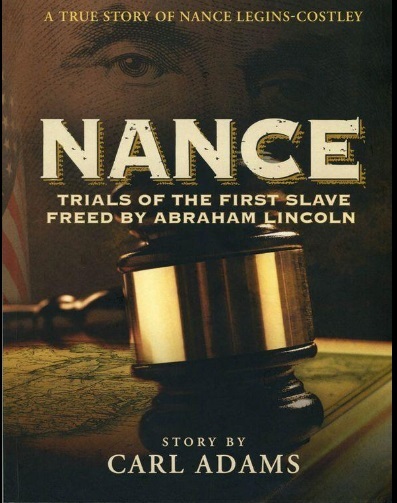 Entitled “Nance: Trials of the First Slave Freed by Abraham Lincoln – A True Story of Nance Legins-Costley,” it was written by local historian Carl M. Adams and illustrated by Lani Johnson of Honolulu, Hawaii. 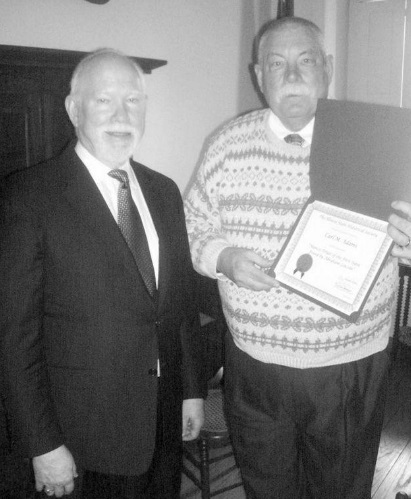 Adams, formerly of Pekin, then resided in Germany (but now is in Maryland), and was unable to attend the awards banquet in Springfield, so he asked his friend Bill Maddox, a retired Pekin police office and former city councilman, to receive the award on his behalf. 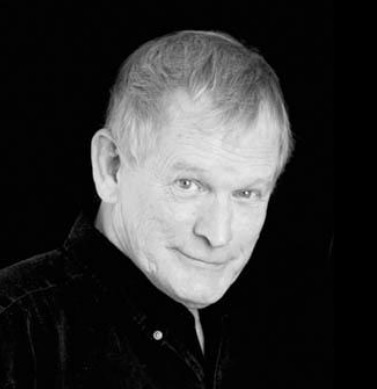 Maddox is one of Adams’ collaborators and over the years has helped Adams in organizing his research. Remarkably, Bates doesn’t mention how Nance obtained her freedom, nor does he mention Lincoln’s role in her story. He doesn’t even tell us her surname. That’s because the details were then well-known to his readers. Later, her case would get a passing mention in the 1949 Pekin Centenary, while the 1974 Pekin Sesquicentennial would provide a more extended treatment of the case. But in none of the standard publications on Pekin history is personal information on Nance and her family included. Since she had been forgotten and scant information was available in the standard reference works on Pekin’s history, Adams had to scan old census records, court files, coroner’s reports and newspaper articles to reconstruct the story of Nance’s life and the genealogy of her family. He learned that Nance was born about 1813, the daughter of African-American slaves named Randol and Anachy Legins, and that she married a free black named Benjamin Costley. Nance and Ben and their children appear in the U.S. Census for Pekin in 1850, 1860, 1870, and even 1880 (though the 1880 census entry is evidently fictitious). The 1870-71 Pekin City Directory shows Benjamin Costley residing at the southwest corner of Amanda and Somerset up in the northwest corner of Pekin. Perhaps not surprisingly, Ben and Nance’s log cabin was adjacent to the old Bailey Estate, the land of Nance’s last master, David Bailey, one of the principals of the 1841 case in which Nance won her freedom. 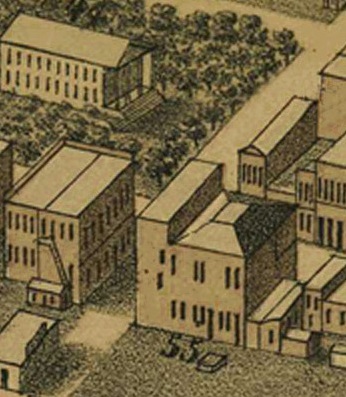 On this detail from an 1872 map of Pekin, from the 1873 “Atlas Map of Tazewell County,” a star indicates the location of the home of Benjamin Costley and Nance Legins-Costley and their children.